South African Ambassador Ebrahim Rasool received a top Club award Nov. 19 at an event that highlighted President Myron Belkind’s effort to make the organization a hub of international activity. Belkind took over as the Club’s leader in January, promising to pursue an international theme in programming during his tenure. 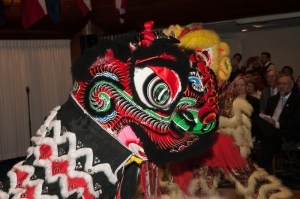 The International Cultural Evening featured performances by dancers and musicians from Asia, Africa, India, the Middle East, Russia, the Caribbean and Latin America before more than 300 people, including diplomats from around the world. “Tonight, the National Press Club’s reputation is being expanded from a place where news happens to where culture happens,” said Belkind, who worked for four decades as an Associated Press reporter and bureau chief in Kuala Lumpur, New Delhi, London and Tokyo before returning to the U.S. in 2004. At the end of the evening, Belkind received the first distinguished volunteer leadership award from the World Affairs Council of Washington. Club member Tony Culley-Foster, the council’s global communication committee chair, praised Belkind for the “internationalization" of the Club. Rasool was given the NPC President's Award in recognition of the close relationship he forged between the Club and South Africa over his more than four years in Washington as the country’s ambassador. Rasool will complete his ambassador assignment in December. He was instrumental in supporting the South Africa Night at the Club in 2012 that celebrated the life and legacy of former President Nelson Mandela, while the historic leader was still alive. He also ensured that current President Jacob Zuma appeared at the Club in August during his trip to Washington for the U.S.-Africa Leaders Summit. Zuma’s speech occurred 20 years after Mandela himself visited the Club. The Club is a bridge between cultures in a world capital, Rasool said. “I think that what this National Press Club is busy with is to connect people, to unite us, to speak to us in the language that is beyond the ordinary language that divides, that polarizes, that creates all kinds of opposites within us,” Rasool said. He said his goal as ambassador was to bring to Washington the kind of generous and constructive spirit that Mandela embodied as he led his country’s journey from apartheid to freedom, democracy, forgiveness and reconciliation. Mandela continues to be a role model for “soft power” in a world riven by conflict and extremism. He said that he hoped that his recognition from the Club was an indication that he had been successful in leading his team at the embassy in continuing to develop South Africa’s story and its place in the world. “Maybe I may have succeeded even a little bit of turning the South African embassy into a representative of the great values, the life and the legacy of Nelson Mandela,” Rasool said.